In the Paris of the early eighteen-nineties, at the height of the Decadence, the man of the moment was the novelist, art critic, and would-be guru Joséphin Péladan, who named himself Le Sâr, after the ancient Akkadian word for “king.” He went about in a flowing white cloak, an azure jacket, a lace ruff, and an Astrakhan hat, which, in conjunction with his bushy head of hair and double-pointed beard, gave him the aspect of a Middle Eastern potentate. He was in the midst of writing a twenty-one-volume cycle of novels, titled “La Décadence Latine,” which follows the fantastical adventures of various enchanters, adepts, femmes fatales, androgynes, and other enemies of the ordinary. His bibliography also includes literary tracts, explications of Wagnerian mythology, and a self-help tome called “How One Becomes a Magus.” He let it be known that he had completed the syllabus. He informed Félix Faure, the President of the Republic, that he had the gift of “seeing and hearing at the greatest distances, useful in controlling enemy councils and suppressing espionage.” He began one lecture by saying, “People of Nîmes, I have only to pronounce a certain formula for the earth to open and swallow you all.” In 1890, he established the Order of the Catholic Rose + Croix of the Temple and the Grail, one of a number of end-of-century sects that purported to revive lost arts of magic. 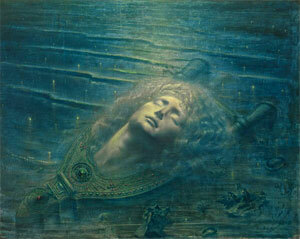 The peak of his fame arrived in 1892, when he launched an annual art exhibition called the Salon de la Rose + Croix, which embraced the Symbolist movement, with an emphasis on its more eldritch guises. Thousands of visitors passed through, uncertain whether they were witnessing a colossal breakthrough or a monumental joke. -- Erik Satie - Du fils des étoiles: Satie's music for Le Fils des étoiles (The Son of the Stars) comes from about the same period as his most famous work, the Three Gymnopédies. It shares with it the same modal flavour, sense of timelessness, and static quality. The music originated in a brief friendship with Joséphin Péladan, founder of a mystic organization called Rose + Croix du Temple et du Graal (Rose + Cross of the Temple and of the Grail). Péladan sought to effect a reconciliation between Catholicism and Rosicrucianism and was also affected by Wagnerian mysticism, particularly that of the opera Parsifal. Péladan appointed Satie the "official composer" of the Temple. It is likely that Péladan was attracted to the antique, mystic, and ritual quality of Satie's music. As such, Satie composed music for Le Fils des étoiles, a mystery-play. The original version was for flute and harp, but Satie published it as three preludes for piano. The music had elements of radicalism -- the harmonies were free-flowing, with no sense of a cadence. The lack of direction throughout the music suggests an eternal music that goes on outside the bounds of the composition as performed. Moreover, the music was notated without bar lines. His contemporary Joris-Karl Huysmans remains a cult figure—“Against the Grain,” Huysmans’s 1884 novel, is still read as a primer of the Decadent aesthetic—but none of Péladan’s novels have been translated into English. So when an exhibition entitled “Mystical Symbolism: The Salon de la Rose + Croix in Paris, 1892-1897” opens at the Guggenheim Museum, on June 30th, most visitors will be entering unknown territory. The show occupies one of the tower galleries, in rooms painted oxblood red, with furniture of midnight-blue velvet. 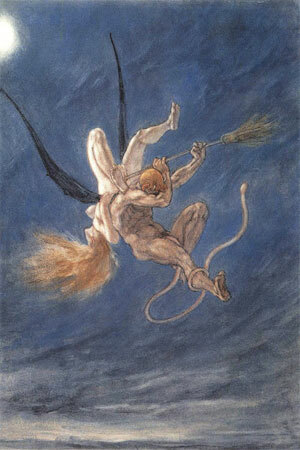 On the walls, the Holy Grail glows, demonic angels hover, women radiate saintliness or lust. 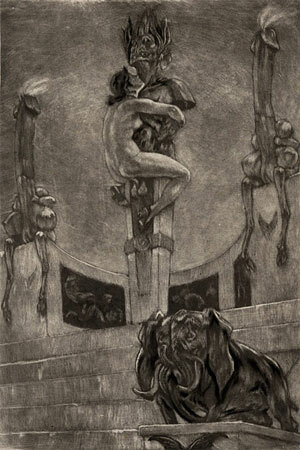 The dark kitsch of the fin de siècle beckons. He made his name first as an art critic, railing against naturalism and Impressionism, both of which he considered banal. “I believe in the Ideal, in Tradition, in Hierarchy,” he declared. 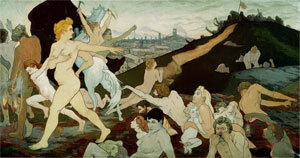 His model artist was Pierre Puvis de Chavannes, who rendered neoclassical subjects in a self-consciously archaic style, flattening perspectives and whitening colors. “What he paints has neither place nor time,” Péladan wrote. “It is from everywhere and always.” Yet he also had a taste for lurid, graphic imagery: the eerily glittering Salomé pictures of Gustave Moreau, the diabolical caricatures of Félicien Rops. Péladan singled out for praise Rops’s “Les Sataniques,” a series of etchings depicting visibly aroused demons penetrating and killing women. 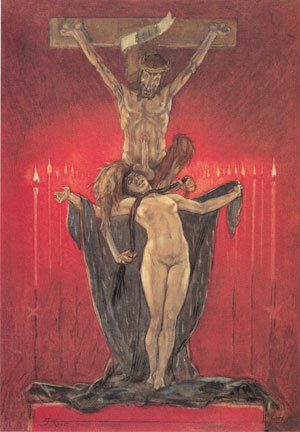 Félicien Rops - "Le Calvaire". 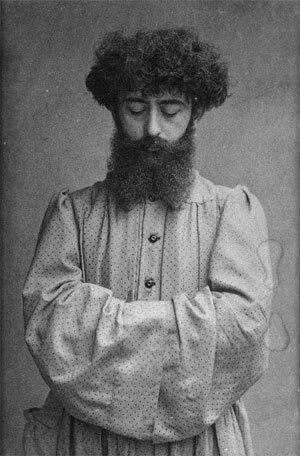 Péladan’s pendulum swings between piety and depravity were characteristic of his milieu, although in his case the oscillation was particularly extreme. Antoine La Rochefoucauld financially supported Rosicrucian salons in Paris in the 1890s and was Grand Prior of the movement from 1892-1897. These salons were a focal point for mystical studies and promoted the idea of gestes esthétiques, a synthesis of the visual arts, literature and music. The third of Erik Satie's Sonneries de la Rose+Croix was composed in his honor. 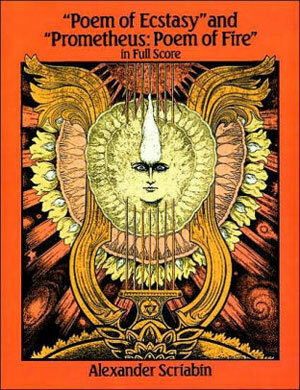 As for Schoenberg, he was immersed in mystical texts at the time of his atonal leap: in terminology reminiscent of Péladan, he explained that whereas conventional major and minor chords resembled the opposition of the two genders his new chords could be compared to androgynous angels. Even the cool intellect of Igor Stravinsky was touched by theurgic energies: the neo-pagan scenario of “The Rite of Spring” was co-created by the Russian Symbolist painter Nicholas Roerich, who went on to have a spectacularly strange career as a Theosophical sage. Such questions presuppose a clean line of demarcation between the real and the fake, and in matters of the spirit that line can never be fixed. 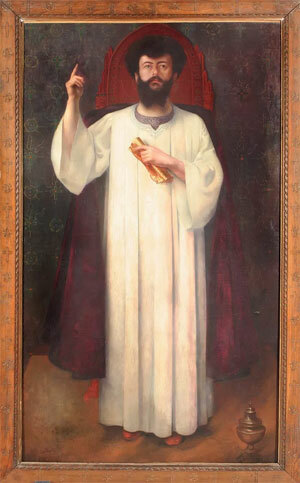 In a sublimely daft portrait by Delville, Péladan hovers before us in priestly white garb, his eyes rolled back, his index finger pointing heavenward. He is the failed prophet of a nonexistent faith. Nonetheless, his conviction is unnerving. Entire religions, entire empires, have been founded on much less. MARCH-APRIL 2008 issue of Quest magazine.